With love as the lamp, deep yearning as the butter oil and thoughts soaked in bliss divine as the wick, I lit a sparkling spiritual light – where the self melted and dissolved – for Nārāyaṇa, and composed this inspired Tamil poem illumined by that light. If only we recite Nārāyaṇa’s names in a state of pure love born out of inner realisation of His ‘svarūpa’ and ‘vibhūti’, and our relationship with Him, that will surely elevate us to the level of our spiritual kinfolk, the celestial beings of Śrī Vaikuṇṭha, eternally blessed to serve the Lord. They, who are devoted to the sacred feet of the Lord of Milk Ocean with offerings of fragrant flowers, will reach His abode of Vaikuṇṭha of resplendent beauty that is beyond the reach of even the denizens of high heaven. Carving out my heart as a citadel, setting thereon my pearl-like love like a fresh bouquet of flowers, embellished with desire for closeness and togetherness like diamond and sapphire, I offered my devotion as a Lotus to the Lord Who carries on His chest Goddess Lakshmi, prostrating to His feet. Oh Lord with complexion of the blue ocean, aeons ago You manifested to ask Mahābali for three paces of land. But You scarcely needed those three steps to traverse this universe. Who can comprehend the secret of Your Feet or presume to speak of them? They indeed are eminently blessed and will find their niche in the sacred Feet of the Lord with complexion matching the dark-blue ocean, who channelizing their sense organs inward with true insight about their relationship with Him, constantly recite and meditate on His names with overflowing devotion and thoughtfully gathered floral offerings. Oh, my heart, deep as the fathomless ocean, seek with fervour the beautiful flower-like Feet of the Supreme Lord Who sports the fire-spitting battle-eager Sudarśana, the Lord who as Trivikrama strode the worlds on His upraised feet, striking abject fear in the hearts of His adversaries, with His curled up lips and rolling eyes. Feigning motherly love, she cradled You in her arms, and snugly entreated You to feed on her surging, radiant breasts. Then, You putting on child’s natural innocence and joy outwardly, but with seething anger inside, pretended to drink milk, but sucked her life out. Seeing her drop dead thus, and with overflowing concern, the fearless cow-heard queen Yaśodā then and there breast-fed You. In comparison to her melting compassion is the vast expanse of this universe surrounded by oceans that You once scaled, any bigger? Oh, Protector of everything, as a child You, with a mere kick smashed the leviathan rolling cart into smithereens. Accepting the gift of this earth, You with caressing touch, brought to life this withering universe. Because my thoughts are centred on You, I constantly recite Your name, and my hands gather flowers for You. You must remove the residue of my past impressions. They receive mediocre rewards who stand at the portals of lesser gods, day in and day out, falling at their feet for favours. Oh Lord with complexion resembling the far-reaching blue ocean, how many are indeed wise enough to seek Your Feet instead? There is no dividing line among the devotees of the Lord, for the high and low alike worship and prayerfully address the Feet of Him Who rests on Ādiśeṣa'. Does not that illustrious list include the many-splendored Sūrya, the lotus-seated Brahma and the third-eyed Rudra, all of whom seek His presence for their daily worship? Is it not because once long ago, the care-free tusker supremo, entering the sprawling lake for gathering the blossomed lotus to lay at the Feet of the Lord, came to grief at the jaws of the crocodile, and in dismay thought of those Feet of the Lord, Who sports the Sudarśana, in prayerful surrender, that he attained the exalted position in the Lord's abode? Oh the ignorant ones, rather than wasting time on flattery of the worldly ones, who just live to eat stuffing their bellies like a tinsel town, and committing all kinds of follies, with or without intent, go round reciting the names of Nārāyaṇa Who as Trivikrama filled the eight directions with His four lofty shoulders, and by your presence sanctify the land. He drove the chariot for Arjuna in the fierce battle-field. In an earlier age, He ran after the make-believe deer, only to lose His consort Sita, and lay down on the bare ground. Were these acts becoming of the Exalted One Who rests on the cool, cosy Ananta? Even if the conscious self may not be able to realise its characteristic of dependence, it is but proper to hold on to the thought of His presence in the heart. Just as one can only prepare the ground for a lake to hold rain water falling on a bush-ridden high land, but cannot make it rain. He is the many-splendored Supreme Controller around Whose proximity the lord of heavenly beings and the lotus-seated Brahma congregate to offer their prayers, and approaching Whom Rudra wearing the crescent on his matted locks, prayed to, for the redress of his sin. Is there anyone worthy of such supplication other than that Lord? As Śrī Vāmana' You resumed overlordship of all the worlds. As Nṛsiṁha of insuperable prowess, You planted Your nails and tore the chest of the formidable foe Hiraṇya. Yet another day, You took all the seven worlds scaled by Thee, for safe-keeping inside Your stomach. These were then the legitimate deeds of the lofty lotus-eyed Lord, loftier than the high heavens. You kicked the demon disguised as a hurtling juggernaut to his death. That was not what could be considered proper for Your age. So You should not take it that way. Then, Your even more daring act of hurling the demon that came in the garb of a calf at another who lay hidden in a wood-apple tree, killing them both at once, is like trying to hide a beacon light under the bushel. They lead a life of joy and fulfilment who constantly worship You Nārāyaṇa, in the prescribed way, steering clear of foisted charges and sins of commission, even as they who are set on the course with all favourable factors, in worshipful prayer and with a sense of deep involvement. The humans are endowed with a mind that can contemplate the divine. Time is at hand for us to engage the mind in worshipful prayer, and lotuses fit for worship abound in tanks. Śrī Vāmana’s beautiful Feet are ready and to bless our bowed heads. With so much going in our favour, will hell ever haunt us? The path to liberation is blessed with the grace of the Lord Who is forever ready to remove whatever hurdles beset the path. Was not the dark skinned Gajendra with pearly-white tusks, blessed with His grace in overcoming the onslaught of his adversary, for his devout service of offering a lotus from the cool pond to the Lord? The Lord Who hurled the demon-calf at the fruit-laden wood apple tree scattering away its fruits, and Who, in an earlier incarnation, had taken another form to encompass this earth under His Foot, blesses all beings who bow at His feet in keeping with their goals. Oh my good heart, don't you see that He is the Dispenser of the ultimate grace of liberation as also the binding cycle of saṁsāra? Don’t you see that He is the inner Controller of the sense organs and the five elements of air, fire, water, ether, and earth? He is also the manifest universe, the rising mountains, and at the time of dissolution the unleasher of blazing fires capable of turning the dark oceans dry. Don't you see? The Lord Who rose in anger against Lanka, and put an end to Ravana, is also the One of abiding and exalted qualities worshipped by the heavenly beings. In a manner of speaking, He is the same One Who has come to abide in Vēṅkaṭam of cool ranges where bamboos rise high. Tiruvēṅkaṭam where Śrī Vaiṣṇava's reside, and to which the denizens of heaven hast en vying with one another for the worship of the Lord, is the gift of the Lord Who rests on the Milk ocean, to the celestial beings of Śrī Vaikuṇṭha, who have controlled the body made up of the five elements and the five senses which are a stumbling block to spiritual progress. Having rested on Thirumalai, my racing, seeking mind, impelled by an upsurge of desire, rushed past the moon exploring the high heavens in search of the Lord in Śrī Vaikuṇṭha, like a creeper seeking a support staff to hug and spread around. Hailed as the Deva among devas by countless beings, resting on the Milk Ocean, my Lord Who once had, as tiny Krishna, tom asunder the face of the demon Keśi, now abides in Tiruvēṅkaṭam and in the ineffably beautiful shrine at Śrīraṅgam, and also with me in my mind. You - Who, in an earlier age, had reduced the beautiful Lanka to ashes with your arrows - let demoness Pūtanā take you up in her arms, telling yourself,' let me drink from her beautiful bosom to the brim of my stomach ', sucking her life out along with the milk. In so doing, you made your mother unsure of what to make of you. Oh, Lord of Śrī, with body resembling the big blue ocean, once upon a time You as Trivikrama measured the world. Another time you brought forth the submerged world from the depths of the ocean floor. Yet another time You churned the ocean, and in a yet different age, built a bridge across it. So say the sages of yore. It is they who hail the Lord as the great Benefactor each passing day saying, 'Today dawned well', and worship the Feet of Śrī Varaha with fragrant flowers from the Kura' tree, that will experience the joy of His beautiful Form. Oh Lord of Śrī, My mind steadfast in thoughts focused on You, was ecstatic. Next my tongue forever praising your sacred feet rejoiced. My whole frame engaged in the act of singing and swaying to the glory of your blazing disc, conch and other armament, rejoiced in that experience. My thoughts have settled dwelling constantly on the sacred names of the Lord wearing the cool Tulasī garland. My body always bows in reverence toward the Lord abiding in the bamboo-laden Veṅkaṭa hill. My tongue too engages itself in the constant refrain of reciting His great qualities. I have become Your eternal servant through the special grace showered on me at all times, worshipping, with fragrant flowers and incense, and in a spirit of overflowing love, Your sacred feet that once upon a time scaled this universe under a ruse as a gift of three footsteps of land. Oh, Master, the ignorant look upon sensual pleasures as sustaining. Some would say that water is life - sustaining rather than sensory perception. Instead of being preoccupied with either, if only men would crave for even a little bit of your experience, that would indeed redound to their well-being under all conditions. The vainglory of the gross worldly beings, tends to push them deeper into the morass of worldliness. They that are deluded wallow in ignorance. Oh, my heart, rest meditating on the wondrous Lord Who took this earth from Mahābali unobtrusively, swallowed it for safe-keeping at the time of dissolution, and brought it forth again at the dawn of creation. Oh Lord, Who gave to the world the wise Brahma from the big, cool lotus sprung from your gracious navel. Our many recurring lives are all futile, if we fail to praise, and our heads do not bow in homage to your sacred Feet. Instead of gloating over material possessions as ours, understand what is our true wealth with a mind that is forever focused on Mādhava as everything to us and recite His name as the gospel of the Vedas, appropriate for the tongue to recite. The worship of the Supreme Being in the form of recitation of His names is the quintessence of the scriptures. If you know the Vedas, you will understand this truth. To those who are bereft of this Vedic knowledge, Let me tell you, the substance of the Vedas is reciting Mādhava’s names. It will suffice to understand this. Before phlegmatic and other fluids begin to rack and waste away the body, think of the Feet of the Lord adorned by Śrī on His chest. Sensual pleasures which delude even cultured minds conversant with the greatness of His Feet, are without any substance whatever. Paradise cannot be reached by worldly riches. It is the compassionate Lord's grace that can make it happen. Oh my heart, do not forget to meditate on the sacred Feet of the blue- complexioned Lord Who has given Himself to the realised souls. May my thoughts dwell on the Lord of Śrī, with a desire to behold His stately shoulders. They who cherish such a thought will not suffer the travail of repeated births. They who worship His shoulders, will view the lesser pleasures of worldly life with disdain. The greatest good that my blessed shoulders can do me is to bow in reverence to the feet of the devotees who worship the sacred Feet of the Lord, He Who struck with arrows to chop down the twenty shoulders, and all ten heads and two legs of Rāvaṇa. I will not look upon those human beings as deserving their birth as such, who have forgotten the name of the Lord with eyes resembling the red lotus, the sure passport to liberation of His savants. With a mind, that is forever fixed on Mādhava, the embodiment of compassion, always think of reciting His names as the purpose of life. They who are wedded to the sacred Feet of the Lord at Vēṅkaṭam, the subject and substance of the unfathomable Vedas, in Whose sacred Feet the denizens of heaven rest their heads, are not inflated by the vanity of worldly riches, nor are they like others who lose their heart over losing what they had yesterday. The Supreme Lord with long, magnificent arms, and resembling the resplendent blue ocean, abides from time immemorial in Thiruvarangam and Thirukkoṭṭiyur. He also resides for long at Vēṅkaṭam, and in beautiful Thiruneermalai set amidst lovely gardens. Arise to worship my Master at dawn, with folded hands and with flowers placed at His Feet, and heart overflowing with fervour for His presence, He Who protected this universe, variously, by scaling, lifting, ingesting and recreating every aeon, and Who in one such incarnation, materialised as Lord Nṛsiṁha. Oh the Compassionate One, You bring the Vedas to light You set the order and explicate the truths contained in them. You remain in the constant company of the lotus-born Mother. You reside in the enchanting Tirumāliruñcōlai covered by vast corridors of bamboo, and circumambulated by denizens of this land. Oh my heart, nestle upto Hun without fear, the sweet-tongued Lord, Who shook the seven big mountains, the seven continents and the seven seas, by sucking the life out of Putana' of poison-smeared breasts, lisping appreciatively while drinking. Oh the Scion of Yadu clan, the difficult-to-imagine child of the shepherd clan, the dazzling Performer of unbelievable deeds, - with aforesaid thoughts resonating in me, I will call the Lord of Śrī before everyone by the names that the blessed Gopis addressed Him in Gokulam, the very exalted names that cut asunder the Gordian knot of saṁsāra. Oh my heart, meditate on the sacred Feet of the Lord with the complexion of the blue ocean. Meditate on His exalted names. Meditate also on the blue complexion of Him Who once left His abode on the milk ocean to chum the oceans. My Lord resembling the rain-bearing black cloud, with chest adorned by the Divine Mother, Whose abode is the big lotus flower, is a tower of grace. How can anyone fathom the magnanimity of Him Who merely condemned the culpable Mahābali, no less a demon than Ravana, to exile in the nether world for his errant ways, eventually rewarding him with Indra loka. It is Tiruvēṅkaṭam of rustling streams in full flow,- where along the winding paths, ascetics sit rooted in samādhi, with profuse locks knotted and dangling on the back of their heads, like small mounds of earth around which creepers spread all the year round, - that is our coveted destination. Even as You graciously descended upon the sacred hills of Tirumāliruñcōlai and Tiruvēṅkaṭam, making them Your favourite abodes, You now regard Your shrine in my heart as a favoured residence. On that score, do not ever forsake Your abode of the surging milk ocean. This is my humble prayer. Oh my Omniscient Master, holding the chakra' that is ever triumphant in battles. I had never forgotten You through the cycle of repeated births in view of Your steadfast and ever thoughtful compassion. Grant me that I may now immerse in the ocean of everlasting bliss. When the passion for His vision grows out of hand, how shall one exercise self-restraint, in order not to appear impatient? Do not despair. Even before the Lord chooses to bless us with the vision of His golden form, the Divine Mother is ever eager to hasten that process. Hear ye in all four directions, hold steadfast to the practice of singing the praise of the gracious Lord blessed by Divine Mother, abiding with Him forever. Let us rightly sing the praise of the sacred Feet of our Master endowed with beautiful long hands. Though singing the Lord's praise may be akin to the taste of neem, the goddess of learning Sarasvatī has favoured us by residing in our heart, urging us to sing about the Lord with the golden chakra', and endowing us with this ability. This poetic inspiration is due to the grace of the compassionate Lord. When the Lord cast His benevolent glance at us, His devotees, showering on us the grace of constant remembrance, making some substance out of mere straw, my ignorance dispelled, I looked closely at the reality of God and Self, and meditated on His Feet resembling the lotus flower. I then offered my soul to those feet without a thought of any other recourse. Oh Lord, Yours is not just the face of the Supreme Deity, your essential nature is the effulgent expression of being the constant support of your devotees. The beings of this great earth visualise You as the transcendental reality. lt is however, those who understand You as the incomparable repository of redeeming grace, who will truly and for long help conserve this world. A long time ago, as a small dark brāhmin boy, when You deceptive contriver, asked for the gift of three steps of land, one Foot that supposedly stood on the land filled this earth in a trice, and your towering shoulders traversed in all directions, so say the learned ones. That was a big grace that the faithful ones received from You, Oh Lord. I bowed in prayer to Krishna, the supreme Leader of the Yādava clan, Who drawn by love towards Nīla Devi, performed the feat of breaking the horns of the bulls, set as wager for her hand. In my ignorance I had been oblivious of the bliss divine and the sad loser for this. The story of how my Master Who had subdued and eliminated the seven bulls, filled blood from His own hand, into the raw skeletal head - swarmed around by scavenger vultures, - stuck in the hand of fire-like red-complexioned, bull - riding Siva, to liberate him from his curse, is a long one to relate. Oh my Master Krishna, if one prays to You in the light of the substance and spirit of the epics, such prayers address only your name. Lord of Śrī, the very embodiment of the eternal scriptures, bless me that I may experience You in the resounding Vedic notes. Oh Lord of Mother Lakshmi, I bowed to your beautiful Form, and lovingly decorated your pink feet with pretty lotus flowers. Desirous of worshipping You, and with vision fixed on your supreme abode, I made bold to seek my repose there to offer my prayers to You forever. Oh my good heart, you have seen how insidious is this worldly life and the suffering unleashed by it. It is the gateway to hell and is to be devoutly avoided, by reciting the names of Nārāyaṇa. If you will, think about the degradation of this existence. I was blessed with the vision of His beautiful Form in my dream. In that I beheld in His hand the dazzle of die fire-spitting Sudarśana. In that vision again, I experienced His spontaneous grace capable of cutting asunder the binding karmic affliction, and the underlying residue of past impressions. The Lord churned the ocean with the sparkling Mandāra mountain as churning stick, and the shiny serpent Vāsuki as rope, in order to quell the asura' race equipped with a fierce fighting force armed to the teeth - He Who snapped the tusks of the rogue elephant in another age. They who have become royal highnesses and rule over this earth, riding their high horses before our eyes, are what they are, because they were devotees in their several preceding births who placed cool lotuses at the exalted Feet of the Lord Who has a navel adorned by a red lotus flower. The heart of a true devotee is verily like a shrine, be it Tanjai, or hallowed first among Divya deśa’s Śrīraṅgam, or Thiruthangal, or the ever cool Tiruvēṅkaṭam the cherished treasure house of devotees, the milk ocean, Kadanmallai always in the thought of devotees, Thirukkovalur, or the high- walled Tirukuṭantai, the abode of my Lord Śrī Rāma. When the Supreme Lord of the universe bestirred himself from his bed of the serpent Anantha' puffing out venomous fumes from the mouth, to lift his flower-like foot in order to measure the worlds in all directions, the Śankha on his left Hand, blew loud, and the fiery Sudarśana rendered all adversaries nervous by its sparkle. Rising at dawn, the primates would dip in the flower-laden ponds, and gather the freshly blossomed flowers to offer in worshipful prayer. Oh my heart, you also hasten to recite the names of my Lord, and offer flowers at the lotus Feet of Him Who is the Jewel of Tiruvēṅkaṭam. Firm in resolve to serve my Lord Nārāyaṇa, the Supreme Protector, —Who saved the red-eyed Gajendra with crescent - like tusk, — I will recite his thousand names, at all times of day, morning, noon or evening, sprinkling whatever flowers I can gather. My Master, in life after life, and in all states, I dedicated myself to your service. I have been blessed with the fruit of my penance now, and the opportunity to adorn your sacred Feet with this garland of mellifluous Tamil verses. It is your grace that I excel in the Tamil arts. Behold Tiruvēṅkaṭam the exalted mountain of the Lord resembling the hue of the blue sky, where the tusker driven by mast could be seen mesmerised in front of its favourite mate, and offering to it a succulent bamboo plant of just two rings plucked by it, and dipped in honey oozing from a honey comb nearby. Gathering plenty of mountain sandal paste, exquisite jewellery and silks, as also fragrant jasmines, worship prayerfully, with bowed head, as befitting a true devotee, the sacred Feet of the all-knowing primordial Cause of all creation. See my good heart, it is but proper for us to worship the exalted Feet of the Supreme Lord of all beings. It is fitting to adorn his Feet with pretty lotus flowers. Adorning them thus, and bowing in reverential homage, and worshipful prayer, it behoves us to engage in penance of constant recitation of his Sahasranāma. It was only the four-faced Brahma that reaped the fruit of his devout penance, when he, reciting the many names of the Lord, washed with sacred Ganges water the towering golden Feet of Him when He set out to measure the worlds. In matching comparison to the Feet of the Lord in measuring this vast universe, the greatness of the unparalleled courage and valour of the hero of the epic Rāmāyaṇa, stands out - the Lord who, ever true to his word, would not be dissuaded from his purpose by the mother's plea, nor that of his Consort of slender shoulders, the incarnation of the lotus-born Lakshmi. Being blessed to be your devoted servant, and constantly meditating on your lotus Feet, I have found fulfilment in overflowing love towards your pink sacred Feet. To those blessed with the vision of the bare Feet of the Lord as He scaled the worlds, would the sight of his bejewelled Form hold any greater allurement? In a vision of eternal daylight, I saw Śrīman Nārāyaṇa, in a clearer light than a passing dream. In that vision, I witnessed clearly his resplendent Form as in his celestial abode, with his Chakra' shedding its dazzle on his Body, and his crimson Feet. The lotus -born divine Mother of perfectly chiselled beauty with sparkling eyes having set her sight on the eternal endowed youthfulness of the Lord, is ever in his company. So is Mother Bhu Devi always at his Feet with overflowing love. Does this beauty become ever less because so many drink from it? I spoke of the Lord in inadequate terms in a presumptuous vein, the Master of whom even the Vedas whisper in a venerable tone as 'That'. Having spoken thus, I still looked up to Him, all this while hoping for some tiny part of his infinite storehouse of grace. The Feet of my beautiful Lord are the quintessential nectar of this beautiful spacious land, the Lord Who in half-leonine, half-human form tore up the wilful Hiraṇya inebriated by his brawn and the boons obtained from gods, and unremitting in his enmity to the Lord. The Vedas hail the Lord who wields the sparkling Chakra' as nectar and honey, He who exulted in churning and distributing nectar to celestial beings. I hail my Supreme Lord, and praise and worship him with this nectar-like garland of verses. What fruit have the learned ones reaped by their prayer to the Supreme Lord, with freshly gathered flowers, and constant remembrance and utterance of His sacred names! This is not achieved by tortuous body-beating penance, but by His grace. How else have I been blessed by His vision except by the grace of my Lord with complexion like a blue jewel and the sky? A long time ago, lying in foetal state, I witnessed the powers of my Lord of Thirukkoṭṭiyur. Drawn by this, I folded my hands in prayer. It is not that only today I have awakened to the drawing power of my Lord's sacred Feet which scaled the heavens and earth aeons ago. Except for those who walk the unfailing path of my Lord of Thiruvarangam, the portals of the bastion of celestials and the abode of my Lord, Śrī Vaikuṇṭha, would shut before others who tread their own fallible path, ever reach them, enmeshed as they are, in the tangled web of hellish existence. This I know now. You finished off the vengeful Kamsa in a burst of anger, and vanquished the battle-tested elephant by breaking off its tusk. 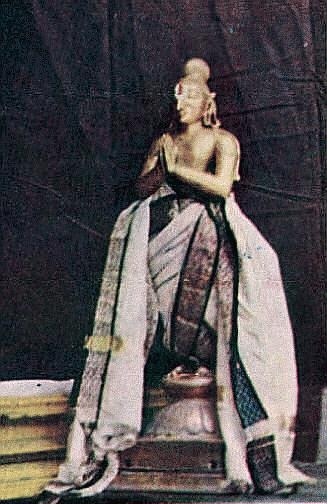 In an earlier age, melting with compassion, You as the diminutive Brahmin, accepted the symbolic offering of water from Mahābali and took away this earth from him. After approaching and submitting in self-surrender to the Lord of Śrī, of pink-lotus eyes, the Supreme Being and our Master, would I not rule over this world, and even walk the corridors of paradise, as a celestial among celestials? Oh confused men, who worry over how best to avoid entering the terrible hell after you have shuffled off your mortal coils. Try to pray to His sacred Feet beforehand, He who scaled the worlds surrounded by dark oceans and has been objectified in various Scriptures. Chant His names and glorify Him, He that has a long memory and a flag that sports Garuda the eagle king and is ever glorified by celestials, Who killed Kamsa before he could even stir, by a mere kick. If you glorify His names thus, it will usher in the desired blessings for you. Hell is a vast cauldron of horrors wrought by the emissaries of death too terrible to bear. Wake up and try to ward off this deathly desolation, by seeking and worshipping the Lord, with the beautiful Sankha' Who tore apart the maned horse-demon, and drank off the poisoned bosom of the ogress. My heart sings the glory of the Lord with complexion of the sky, Who once swallowed the worlds for safe-keeping, and dug into the heart of the sworn irredeemable enemy, and now resides in beautiful Pātakam. You also take to Him and sing His glory in fervent prayer. The great Lord, resplendent like a blue diamond, and resting on the milk ocean, Who in time immemorial absorbed the universe in Himself, and brought it forth for creation of life and tore the hard-heart of the demon Hiraṇya, abides in Athiyur, radiating His grace as always. How gracious of Him that He inheres in my heart and head. Our Lord Who has the eagle king Garuda as His vehicle, and the serpent king with hood embedded in jewels, and patterned in colours, for His bed is the substance of the Veda's which speak of three-fold fires, and is the Master of Rudra. He abides as the presiding deity at Athiyur. My Lord, with divine Mother lovingly seated on your chest, You are the supreme Being with beautiful red eyes, the Head of all celestials, and our Master. You laid down on Ananta with a thousand hoods and mouths at the shrine at Kuṭantai, wishing to abide there. The Lord who has ensconced himself in my heart, came down to this earth, to be raised lovingly in the cowherd family to grow up prancing around with milk pots. As a tiny baby lying on a banyan leaf, He swallowed the seven worlds to be tucked away in a corner of his stomach. What marvel was that! With the celestials beseeching prayerfully for His grace, respectfully looking up to Him, and strewing fresh flowers, the Lord our Master, the Greatest of all, with rosy jingling anklet-laden Feet and bewitching red eyes, and ever gentle and loving towards devotees, assumed the form of the dwarf, and strode the worlds to strip Mahābali of his kingdom. My resplendent, glorious Lord, immeasurably great, Master of all celestials wearing the cool Tulasī garland, Oh Śrī Krishna, Who, in time gone by, hurled a demon disguised as calf, at another disguised as a wood-apple and struck both down. My love for You is like an overflowing river, bursting the limits of my being.